Kale is ideal for fall gardens. Growing kale is easier than growing many of the other brassica family members. Tolerant of most conditions and maintenance-free once planted, kale is an excellent addition to any vegetable garden. Kale is a cruciferous vegetable prized for its leafy greens. All cruciferous vegetables, including broccoli, cabbage, cauliflower, brussels sprouts, collards and kale, are actually the same species - Brassica oleracea. Within the species, kale is most similar to collards, and the two terms are often used interchangeably. Unlike growing other cruciferous vegetables, growing kale is virtually effortless. Kale will grow well even in poor soil, and is generally untroubled by the many garden pests, such as cutworms and root maggots, that plague other brassicas. A cool weather crop, kale will tolerate freezing temperatures up to five degrees Fahrenheit (-15 degrees Celsius.) In fact, the flavor of tender baby leaves are enhanced by a few hard frosts. Although kale is more heat-tolerant than many other brassicas, gardeners in very hot climates will get the best flavor by growing kale very early in the spring or in late autumn. 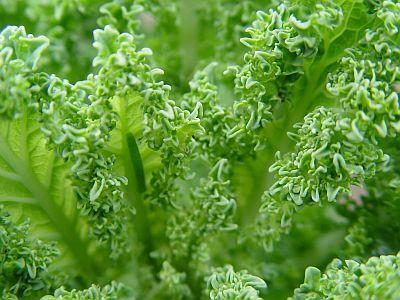 Vegetable Kale: The standard, leafy edible kale that resembles collards. Enjoy the broad, flat leaves of Russian varieties like Red Russian, bunched-up, curly-leaved Scottish varieties like Blue Curled Scotch Kale, or beautiful heirloom varieties like Lacinato. Chinese Kale: Also known as Gai Lan or Chinese broccoli, Chinese kale is smaller and more delicate than standard vegetable kale, more closely resembling broccoli leaves than collards. Ornamental Kale: If you grow ornamental kale, it will be the first burst of color to grace your flowerbeds in the spring and the last holdout in the fall. Try the bright purple, feathery Peacock or compact, multi-colored Northern Lights. Walking Stick Kale: For kale that is both edible and functional, try this novelty variety. Pick the leaves for eating as it grows, then in the fall harvest the tall stalk to make your own distinctive walking stick. The only thing kale requires is a little space to grow. Prepare your garden beds as you would for any other vegetable, cultivating the soil to make it nice and loose for easy root development. Kale does well in single rows, in raised beds, or as part of a comprehensive intercropping plan. Kale makes a good companion for herbs such as garlic, rosemary, mint, onion and dill. Radishes, tomatoes, lettuce and beans also appreciate kale as a neighbor.Expect to harvest about two pounds (about one kilogram) of kale per plant. If you want to have fresh kale available throughout the growing season, plant two separate crops. Plant the first crop very early in the spring, and the second just as you are harvesting the first. If you like, you can start seeds indoors alongside your other vegetables, but kale is so hardy it is really not necessary. Sow seeds directly into the ground in early April, or as soon as the soil can be worked. Space seeds as close together as two inches (about five centimeters) or as far apart as eight to 12 inches.Sow seeds to a depth of about 1/2 to one inch, or about the depth of your fingertip. Cover lightly with soil, and water regularly at least until the plants are well-established. Begin to harvest your kale as soon as the leaves reach about six to eight inches (15 to 20 cm) in length. Pull young leaves directly off the growing plant, as you would with leaf lettuce.In addition to being easy to grow, kale is one of the most nutritious vegetables you can grow, and is especially rich in vitamins A, C and K. Enjoy kale cooked, in soup, or even as part of a salad.